This year’s Highlights of South Australia tour was run from 20-25 November, through a variety of habitats within South Australia. Covering the Flinders Ranges, outback, Gluepot, Murray River and coast near Adelaide, the trip was guided by Peter Waanders, assisted by Helga Kieskamp. In 6 days the trip totalled 180 bird species including goodies such as 3 species of Grasswren, Scarlet-chested Parrot, Inland Dotterel, Freckled Duck as well as some interesting mammals. We commenced the trip with a visit to the Greenfields wetlands, north of Adelaide. Plenty of waterbirds and waders were present here. Good sightings included Australian Spotted and Spotless Crakes. A little way from here, at Pt Gawler, we observed Slender-billed Thornbills in the low mangroves. A walk around the Arid Lands Botanical Gardens in Pt Augusta yielded a good variety of Honeyeaters including White-fronted. Towards the end of the day we spent a pleasant hour at a lake observing Orange Chats, Musk Duck and all 3 species of Grebe. After an early start we spend the entire day exploring the Strzelecki desert around Lyndhurst and Marree. Stony gibber plains, dry creeks lined with ancient Eucalyptus trees, low sand dunes covered in shrubby bushes, and dry floodplains yielded a wide variety of birds. These included Rufous Fieldwren, Little Button-quail, Cinnamon Quail-thrush, White-winged Fairy-wren, Chirruping Wedgebill, Orange Chat and even one Gibberbird. After trying a number of sites we eventually also found a pair of very obliging Thick-billed Grasswrens. At a lake in the middle of the desert we saw Australian Pratincole and many waterbirds including at least 30 Freckled Ducks. At the end of the day we returned to Lyndhurst where at sunset we had excellent views of a family of 6 Inland Dotterels. What a great way to finish the day! We spent the entire day in the Flinders Ranges, exploring the rugged yet beautiful gorges, rock formations and mountains by 4WD and on foot. The beautiful Yellow-footed Rock-wallabies were showing well at their usual haunt. Good birds we saw this morning included Grey-fronted Honeyeater, Red-capped Robin and Peregrine Falcon. After a sumptuos lunch in the Wild Lime Cafe in Blinman, we started the search for Short-tailed Grasswren. Within half an hour we found a very obliging pair showing well and even allowing photographs! High fives all around. We checked in at our accommodation at the Wilpena Pound resort, where some people chose the swimming pool, while others continued birding, resulting in Inland Thornbill and Rufous Whistler. An evening spotlighting session was unsuccesful although we heard Tawny Frogmouth and Southern Boobook. We set off on a pre-breakfast bird walk around Wilpena Pound, following which we departed south. Southern Scrubrobin, Inland Thornbill, Red-capped Robin and Australian Ringneck Parrot, amongst others, were seen. The majestic Wedge-tailed Eagle was seen at close range a number of times. At Orroroo we had lunch and checked out some Aboriginal rock carvings, and had close views of Variegated Fairy-wrens. At Burra we saw an immature Nankeen Night-heron roosting in a pine tree. At Morgan we had glimpses of Redthroat, which unfortunately wasn’t very cooperative. We met the Murray River, and started seeing waterbirds, including White-necked Heron and Black-tailed Native-hen. We then headed to Waikerie for the night. A big day at Birdlife Australia’s Gluepot Reserve. We commenced early as it was going to be big day’s birding. At the first stop we saw masses of woodswallows, both Masked and White-browed. Chestnut Quail-thrush and Southern Scrubrobin were cooperative here as was Gilbert’s Whistler. Moving on, we commenced the search for Scarlet-chested Parrot, which had been breeding at Gluepot for the 2nd year in a row. It didn’t take long to find a pair with an immature, evidence of successful breeding again. High fives all around! We then started trawling through acres of spinifex in the hope of turning up a Striated Grasswren. After about an hour we were not disappointed with a pair showing well. Time for a well deserved cup of coffee after which we quickly moved on to the next target, Red-lored Whistler. By the time we got to the site, it had started warming up a bit but fortunately the birds were present and we had good views of an adult and an immature.. Nearby, we observed a flock of mostly Black-eared Miners, containing one or two hybrids. Time for lunch and we headed to the impressive visitors centre. In the shady gazebo we enjoyed our sandwiches while a pair of Major Mitchell Cockatoos were quietly feeding in nearby trees! A Splendid Fairy-wren put on a brilliant show. The next hour was spent in the bird hide, overlooking a water trough, observing the frantic comings-and-goings of hundreds (!) of birds, including many honeyeater species and Regent Parrots. The weather was nice and cool today as we spent the morning exploring wetlands along the Murray River, thus adding various waterbirds to the list. A highlight was a nesting pair of Peregrine Falcon. Via Brookfield Conservation Park, a smaller mallee reserve halfway back to Adelaide, where we added Blue Bonnet and Chestnut-crowned Babbler, we entered the Adelaide Hills. 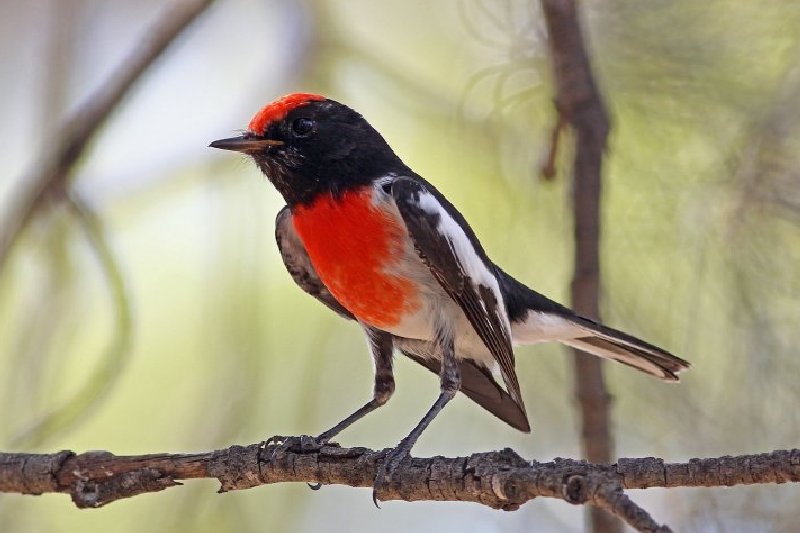 A nice Scarlet Robin was showing well here, as was a pair of White-throated Treecreepers. On the way to the city a Spotted Harrier was seen foraging over wheatfields next to the road. The 4 satisfied participants were dropped back at their accommodation in the evening, after totalling 180 species many of which were lifers for them.